Please have a look around. In the gallery section you'll see examples of windows made for homes, churches, chapels and commercial premises. I also undertake the restoration of windows. Etched glass can be made to order, also mosaic panels. Three dimensional projects range from small lampshades to large domes. The educational section shows recent school projects using various materials including clay, textiles and mosaic as well as glass. This section also has information about classes available at the studio. 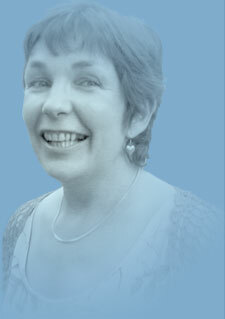 I've been working from my own studio since 1988 and have enjoyed the opportunity to produce such a wide variety of work. Please contact me for prices or to discuss your requirements. St.Mary's Church, Risca, South Wales. 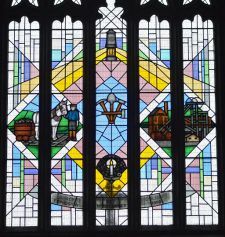 Miner's Memorial Window. St. Patrick. Our Lady of the Rosary Church, Ammanford. Made some time ago but not shown before on my website. 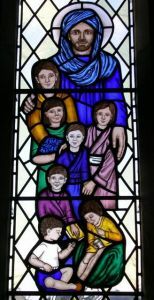 This window was commissioned in memory of a local family of seven children. 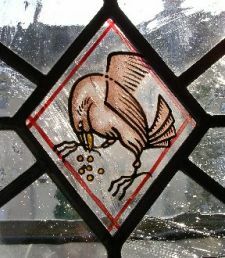 This internal screen features five different Medieval birds. A panel in the style of Charles Rennie Mackintosh; fitted in an opening between a dining room and lounge. In a new bungalow in Ireland.